“A provocative and challenging book and a must read for anyone who wants Canada to operate in a humane and honorable way on the world stage. … If, in fact our country moves away from its pattern of virtue signaling and vice promotion on the crucial topic of imperialism, Yves Engler and his lonely voice of prophesy will be one of the reasons.” Tom Sandborn, Columbia Journal. To read the complete review click here. “Engler has presented a strong compilation of the contradictions of those nominally on the left, acknowledging that they do contribute to many issues – especially domestic – for the left, but falter or fail on many other issues of foreign policy that support imperial endeavours and corporate-state control of other populations.” Jim Miles, Axis of Logic. To read the complete review click here. “Engler writes in a very readable style, and his work is solidly backed by sourcing. Most saliently, his work has a moral core. Left, Right is important and valuable in that it does not only illustrate and lament the corruption of leftist principles, but it also provides solutions about how leftist principles can be upheld; pushing the Left leftwards. Read Left, Right and find out about how the NDP can be made relevant on the Left, about how to increase public awareness, and about how to grow the leftist movement.” Kim Petersen, Global Research. To read the complete review click here. “Yves Engler is Canada’s foremost feisty contrarian. Contrarians oppose what most people think about people and events. They don’t like to bask in the sunlight. They would rather look in the shadows or dimly lit back alleys. If they walk on a summer beach, they pay little attention to the sun glinting off the shells. They want to see what lies under the rocks. Alas! There aren’t many contrarians left. 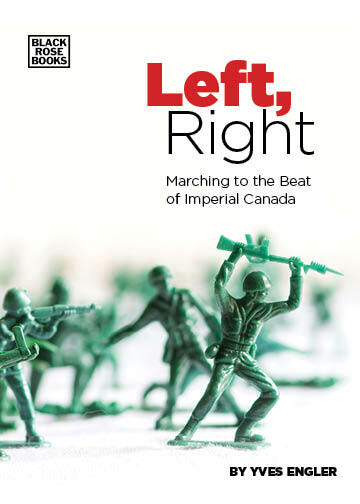 … Engler’s new book, Left, Right: Marching to the Beat of Imperial Canada’s Foreign Policy follows in the train of previous muckraking and debunking books.” Micheal Welton, CounterPunch. To read the complete review click here. “Dans « Left, Right » (« Gauche, Droite »), Yves Engler braque sa radiographie sur un secteur spécifique de la société canadienne, celui qu’on appelle communément « la Gauche » – et l’on aperçoit très vite que cette « gauche » ne sert qu’à compléter la « droite » dans la marche militaire des guerres d’agression sans fin de l’Empire US/UE/OTAN/OCDE.” Jooneed Jeeroburkhan, Le Journal des Alternatives. To read the complete review click here. “Engler’s goal is to deliver the results of his impressively thorough research in accessible language and down to earth metaphor. For example, the author, a former junior hockey player, repeatedly and entertainingly argues that the Canadian military and the business class it serves are best understood by seeing the parallels between the Canadian Forces and the Montreal Canadiens- dubious enterprises that are propped up by major public relations campaigns. This is only one example of Engler’s fluent, genuinely popularizing style, which makes his books both informative and easy to read and digest.” Tom Sandborn, Columbia Journal. To read the complete review click here. “Comparing the marketing of war to the promotion of professional hockey, this work skewers what Engler views as a well-oiled governmental machine pumping out a propaganda barrage. But the Canadian government couldn’t shape public opinion alone, he says, requiring a compliant press, targeted defense funding to universities and think tanks, and corporate entities with an interest in securing weapons deals.” Publishers’ Weekly. To read the complete review click here. “Engler’s A Propaganda System is a dense read in that it is fully referenced and puts forth many connections in a short space. It serves as a great inventory of Canadian propaganda misdeeds, a valuable compendium and resource book for anyone examining global foreign affairs in relation to Canada. In essence, it is an examination of Canada’s ‘deep state’ – the people and the institutions that truly have the power to decide on both domestic and foreign policies. Combined with his previous volumes on the harmful nature of Canada’s foreign policies, Engler has developed a strong, well referenced library of powerful information useful for and informed and critical examination of Canada and its role in the world. ” Jim Miles, Axis of Logic. To read the complete review click here. “Engler’s ninth book encompasses many of his previous research interests. The end product is a who’s-who catalogue, outlining the largest players in constructing a benevolent canon of Canadian foreign policy. Disseminating disinformation is not only a lucrative business for many of those involved, but it is necessary to ensure a stable status quo for the future of the business class, the peddlers of (in)security, the exploiters of the ecosystem, and the elites who transmit these messages through corporate media.” Kelsey Gallagher, Dissident Voice. To read the complete review click here. “The book is well organized and convincing, with simple chapter titles that may be read in any order, according to the reader’s preference. The writing is formal, appropriate to its subject, and the wording easy for the ordinary seeker of truth, calling for little effort on the latter’s part.” Ashoke Dasgupta, Montréal Serai. To read the complete review click here. “Like the renowned Uruguayan writer Eduardo Galeano, Engler likes to compile detail upon detail in order to build his story. His main method is to catalogue the facts, but the result is not a Homeric type of catalogue, which is typically a long list of the gloriously brave. Canada in Africa is a catalogue of dishonour.” Patrick Barnard, Montreal Serai. To read the complete review click here. “If you have ever wondered why Africa remains mired in poverty, constantly at war, and ripe for terrorist exploitation, Canada in Africa delivers a strong answer to that curiosity. It should be a must read for anyone interested in current affairs, modern history, or that dullest of affairs, political science. Yves Engler has written a valuable, well defined, and instructive compendium of Canada’s history and current activities in Africa.” Jim Miles, Foreign Policy Journal. To read the complete review click here. “This is Canada exposed — Canada’s involvement and intrusion into Africa revealed. … Canada’s history speaks for itself — and, by studying it, with this book as a guide, solidarity and antipathy might just be a certainty.” Daniel Tseghay, Rabble.ca. To read the complete review click here. “In this small book of essential facts Engler shows how the government in Ottawa has done radical damage to two vital elements of political life. Inside this country, our federal leaders have deformed the idea that Canadians have held of themselves, as the quietly decent international citizens. Externally, our representatives have diminished the once respected status of Canada as a plausible Middle Power in the eyes of other nations.” Patrick Barnard, Montreal Serai. The read the complete review click here. “In The Ugly Canadian, Engler embarks on a Noam Chomsky-style dissection of Harper’s hard right-wing shift in dealing with the rest of the world. Throughout this fact-packed book, Engler repeatedly demonstrates how Canada almost always favours business interests over human rights, and how that is endangering human lives.” Charlie Smith, Georgia Straight. To read the complete review click here. “The Ugly Canadian is an eye-opening account of how our country is no longer a respected middle power that truly values democracy, the environment and peace abroad.” — Tamara Lorincz , Halifax Chronicle Herald. To read the complete review click here. “Engler’s book is a passionate call for Canadians to pay attention to what is being done in their name. Not only is his research detailed, accurate and at times surprising, and his analysis incisive, but he offers concrete actions to be taken as a path to the future. It remains to be seen if the Canadian government will continue to base their foreign policy on war and destruction, or if they will open their eyes to the resistance to it.— Jody McIntyre on Rabble.ca. To read the complete review, click here. “Some Canadians used to feel smug when Americans were saddled with the awkward and violent presidency of George W. Bush. Only Americans would vote for a warmongering leader. Today that smugness has been wiped away. Harper may be more glib than Bush, but in many ways he stands even farther to the Right. The Ugly Canadian is a damning indictment of cruel, selfish capitalism that dominates federal politics in Canada today. It evinces that ugliness can befall any people anywhere. Zealous patriotism is the vehicle that drives home the ugliness. The Ugly Canadian proffers a way out of ugliness: caring enough to do something about it is absolutely essential for social justice.” Kim Petersen, Dissident Voice. To read complete review, click here. “Reading the book, a couple of things become clear. First of all, Canada’s foreign policy is an ugly thing indeed, catering to an interplay of corporate greed (mining, arms trade, tar sands oil exports), born-again Christian ideologies (Israel), and an eagerness to align with US interests (Libya, Syria, and the list goes on and on). ” Robert Devet, Halifax Media Co-op. To read complete story, click here. “The growing belligerence of Canada’s foreign policy is essentially a combination of right wing religious rhetoric and neoliberal economic policies, both of which have been shown to be detrimental to the environment and other cultures of the world. For a compact and informative source on Canada’s role in this neoliberal religious militaristic environment, The Ugly Canadian is a great resource book. ” Jim Miles on Global Research . To read review click here. “Engler spends the 245 pages of The Ugly Canadian railing against the Harper government’s foreign policy decisions, drawing mostly from media sources to present ten chapters of what amounts to a handbook for anyone wanting to stand in a rally, or maybe just on a park bench, and rant for a while. ” Colin Horgan, iPolitics. To read review click here. “In his new book, Yves Engler sets to demolish the near saintly status of Lester Bowles (“Mike”) Pearson in the public sphere, Canadian foreign policy circles and even on the social democratic left. And in the process, he takes on the much repeated slogan that “the world needs more of Canada.” Paul Weinberg on Rabble.ca . To read review click here. “The monopoly media and a controlled establishment narrative have created an image of Lester Pearson that has endured over time to the present day. Engler examines the narrative and finds it apocryphal. The result is Lester Pearson’s Peacekeeping — a sweepingly persuasive book filled with background and references that makes it easy for readers to research and reach their own conclusions.” Kim Petersen, Dissident Voice. To read the complete review click here. “Engler and Mugyenyi’s activist backgrounds give the book its unique and impassioned tone, whether they are juggling the personal account of getting around the United States on Greyhound buses or synthesizing all existing facts about the automobile industry. The result is a smart and expansive critique of car-dependent North America that is convincing and frightening. This book is an eye-opener for everyone – from the stubborn car-lover to the anti-car activist who wants to brush up on the facts.” Montreal Review Of Books. “Stop Signs is a riveting read on the perniciousness and the falsities that undergird car culture, and importantly, how we can extricate ourselves from the capitalist-serving morass.” Dissident Voice. To read review click here. “At a time of growing global awareness and support for climate justice, Stop Signs is a key read for anyone looking to gain knowledge and insight into the contemporary crossroads faced by societies increasingly dependent and shaped by the automobile.” Rabble.ca . To read review click here. “Stop Signs is probably the most comprehensive assessment of the power of the automobile I’ve yet read. It’s a history lesson on the car, and its rapid evolution and a field guide to Homo Automotivus. As the subtitle suggests, it focuses on the economic, social and environmental, but also neatly summarises topics like health, psychology, race, advertising and planning.” Carbusters To read review click here. “Stop Signs is presented in an interesting, sometimes humorous, nonacademic way. The authors take an ecological approach, observing the car in its economic and social setting. A road trip — by bus — through the US, the heartland of auto dominance and car culture, is the vehicle for much field observation. ” New Socialist. To read review click here. “A must-read.” Halifax Chronicle Herald. To read review click here. “Best critical survey of Canadian foreign policy to date.” Upping the Anti. To read review click here. “Encyclopedic look at Canadian misdeeds.” Toronto Now. To read review click here. “The best gift I could have hoped for as I retired after 35 years as a foreign affairs journalist with [Montreal daily] La Presse.” Jooneed Khan, Montreal Serai. To read review click here. “Broad in scope and packing many a punch, The Black Book of Canadian Foreign Policy is likely to become an important reference for international solidarity activists.” Montreal Hour. To read review click here. “Engler presents an impressive cascade of evidence that Canada is not exactly a force for good in the world.” Montreal Review of Books. To read review click here. “A book that has been desperately needed for a long time.” New Socialist. To read review click here. “Persuasive, well researched, sweeping historical critique of Canadian foreign policy.” Peoples Voice. To reaqd review click here. “Whatever your politics, it’s hard to put down The Black Book without seriously questioning Canada’s image.” Concordia Link. To read review click here. “An extremely interesting and quite largely convincing book.” rabble.ca. To read review click here. “Lays out the facts on Canada’s sinister role as a partner in world imperialist and colonial quests.” Canadian Charger. To read review click here. “Engler’s book is written in a concise, straightforward style that mostly lets the meticulously referenced facts speak for themselves.” zmag.org. To read review click here. “One of the most important studies of Canada’s international role in years… Engler [is]… one of the most important voices on the Canadian Left today.” Briarpatch magazine. To read review click here. “The only book that need be written on Canada’s policies towards Israel… The most carefully documented book relating to the Israel/Palestine conflict I have ever read.” Michael Neumann, author of The Case Against Israel, CounterPunch. To read review click here. “Works like his own excellent little book, Canada and Israel, will provide a solid basis for educating the reading public concerning Canada‘s role in Building Apartheid, and should be mandatory to be read by the politicians of the country.” Jim MIlls, Pacific Free Press. To read review click here. “Engler’s style is clear and direct. He writes with passion and careful documentation.” London Free Press. To read review click here. “Skillfully constructs a coherent narrative … well-referenced and easy-to-follow exposé.” Electronic Intifada. To read review click here. “Fortunately, there are still publishers that will take on writers like Engler.” Canadian Dimension. To read review click here. “Comprehensive… easy-to-read.” Toronto Now. To read review click here. “Indispensable resource for students and activists alike.” Newsocialist. To read review click here. “Fine work.” Zmag.org. To read review click here. “Contains much essential information.” Dissidentvoice.org. To read review click here. “Masterfull” L’aut’journal. To read review (in French) click here. “A stunning examination of the history of Canada-Israel relations and a key read for anyone interested in Canadian foreign policy.” Montreal Hour. To read review click here. “Four good books.” Rick Salutin Globe and Mail. To read column click here.